WordPress plugin popularity has always been pretty tough to figure out. We only had download counts or independent, third party website scrapers to tell us anything. 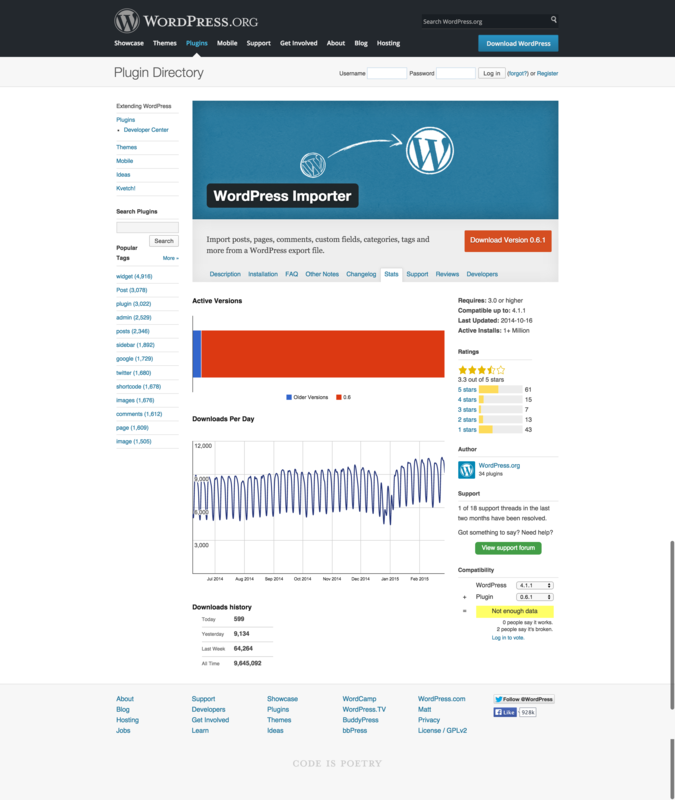 Now, WordPress.org itself has more data that’s being tested and launched to give us real insight into the popularity of WordPress plugins. WordPress has long had download counts for core WordPress, plugins, and themes. But downloads counts are deceiving. They count downloads, but are not representative of actual active installs. Recently — in my Club member newsletter — I noted that it is past time to get data for actual installs, versus download counts. There is a private beta program on WordPress.org that offers just that, and at least some of the new stats are launching very, very soon (edit: the initial changes are now live). Most importantly, the “active installs per day” chart shows us — with much greater precision than we previously had — how many actual websites are running any plugin available on WordPress.org. For the beta period, utilizing a non-public query string parameter, I was able to see these stats publicly for any plugin on the repo. That query string parameter has now changed, so the data is no longer publicly visible. These stats are partially launching very shortly, to highlight the active installs for plugins as well as the breakdown of active versions. Active install counts will replace the download count in the right column. I took some time to look through the most popular WordPress plugins I could think of, as well as other notable plugins. What follows are some of the numbers I recorded, which were noted in the charts as being recorded February 24th. Once this data goes live, the counts will be revised to round with less detail, and for installs over 1 million, will simply say “1 Million+”. As you can see, the data is incredibly insightful, especially compared to the public download stats. However, beware that there is not a guarantee of accuracy here, and in fact you should know that in some instances, the team knows the data isn’t reporting properly, especially for plugins with more installs. Contact Form 7 and Akismet are by far the most popular WordPress plugins, with over six million active installs each. I included most of the plugins from the Popular page on the repo, plus some additional notable plugins. There are also a number of outliers, where the discrepancy between downloads and active installs is huge. I believe this is largely due to plugins with long histories that were once immensely popular but have since faded in popularity. The download count keeps old plugins relevant far longer than if active installs were the prominent number. How accurate is this data? Well, one smell-test we can give it is to compare it to other potentially inaccurate data. From my research, BuiltWith is doing one of the best jobs around of accurately checking site data. Go ahead and input your domain to BuiltWith and see how accurate it is for you. So, if we compare this same plugin list to BuiltWith data for “the entire Internet” — as they segment based on site rankings — then we can get a feel for how well the WordPress.org number and theBuiltWith number get along. In this table, I link to the BuiltWith page so you can get more information if you like. Do note that some plugins aren’t available on BuiltWith, so are in the list but don’t have information. There are zero instances from this list where BuiltWith shows more sites than WordPress.org using a plugin. That is a confidence enhancing note, as WordPress.org should be much more fully comprehensive. There are some instances, especially with plugins that are on the backend, or have limited front-end visibility, where the numbers don’t line up too well. However, for the highly visible plugins, the WordPress.org data feels good to me, in comparison to BuiltWith. The team working on the new stats has less confidence in the numbers as the numbers get higher. So for plugins with well beyond a million installs, they have reason to believe adoption may be different than what is reflected in the stats. WordPress.org collects this data via the update checks that a WordPress install performs. The numbers don’t include websites that have, via code, turned off update checks. Some data is making more sense as it is collected. Now that it’s a few months old, they are able to make better determinations about what is accurate and what is not. Keep in mind the percentage of installs that wouldn’t be included in these checks is minimal. Also, unfortunately, a large percentage of folks just don’t keep dev or local installs of their websites, so those numbers probably do not inflate the totals as much as you may think either — though I’m guessing on that front. For the accuracy of the numbers, the team has seen some discrepancies, where one graph shows data that should also impact another, but it does not. They’re working to resolve these issues still. The team working on this project has been deciding on which stats pages to showcase for the general public, and which to show to plugin authors. The active install data is important, and it needs to be public for users, in addition to plugin authors. If we can ensure that the data is even remotely accurate, it is far superior to using download counts alone. Download counts give legacy plugins too much clout in the repo, and also make misinformation all the more likely. A prime example is that of Slimstats, which had the recent security breach. That plugin has over 1.3 million downloads. But when I looked at the stats, there were only 100,000 or so active installs. Yet, when tech blogs covered the security breach of the plugin, they largely cited “over a million” installs at risk. This is bad for WordPress and it’s unnecessary. We can fix it. We have the data. The current beta stats page was put together as a trial to find what data plugin authors wanted (We’ve been in touch with a few who have provided great feedback in the past on the stats). Based on what they have learned, they are launching the active install numbers and active version chart, and will follow up with a future launch for the plugin author only stats. The plugin author stats are going to go live with the notice that they may not be totally accurate, and they may change over time as the team continues to analyze the data. WordPress is open source, and has absolutely massive adoption across the web, as we all know. It is therefore a source for what’s become a multi-billion dollar industry. WordPress.org and those that hold the keys to the website have great power. Changes to the website and how themes, plugins, and any other potentially business-centric data make a difference to real businesses. All those businesses have signed up for this (being involved with the WordPress project), and therefore any risks associated, but in my mind this data — especially of active installs — brings welcome sunlight to a murky plugin landscape. I’m glad I was able to see this data. I’m very pleased that the active install numbers are replacing the download counts. WordPress itself will be better for it. I too am happy to see download numbers be replaced by install numbers, those are the ones that really count. As you mention, it will help those in the media like I discern between a major announcement to push to people to update a plugin or something a little less low key, even though they’re all important. It’s about time Plugin authors get better stats. It will help them stay in touch with their user base. The more analytic information to base decisions on, the better. Great post, very thorough! Your information about data accuracy and collection is really helpful and appreciated. Great news, so excited by this! As a side note, they seem to have changed it so the maximum showing is now 1+ Million. For example both WordPress SEO and All in One SEO show as 1+ Million for me, rather than the number shown above. The first iteration of these numbers are very end-user focussed, we wanted to separate plugins into broad groups. The next iteration will potentially involve more granular numbers for plugin authors, though we’re still testing the stats to make sure they’re accurate enough for that. As was mentioned in the article, when the numbers are over one million, we’re seeing some variation in day-to-day stats that we’re still figuring out. In the mean time, these new stats serve their primary purpose of giving end-users a rough idea of a plugin’s popularity, and it gives reporters a more accurate number to use when referring to a plugin’s install base. Cool – thanks for the explanation Gary. Akismet is loaded by default in wordpress. I dont know why you included it in your review..
Holy schmoly! I had no idea my plugins were so popular until seeing that list. I assumed the number of active installs was something like 1% of the total downloads, but the number is WAYYY higher than that! I like the way this is progressing…much better for accuracy. This is definitely progress. I used to go to rankwp.com to see estimates of plugins’ popularities. I had long-suspected that it was seriously underestimating the popularity of UpdraftPlus – for which it showed 100,000 active users. This turns out to be a correct suspicion – wordpress.org is indicating >300,000. (Which would get it into your list above. 🙂 ). As noted in the article, it’s not a comprehensive list of the most popular plugins. It’s many of the most popular, as well as other notable ones I thought to include. It’s not a direct representation, but a manual sample. Showing Active install is good for accuracy, As WordPress Plugin developer really needed to know how many people using their plugin instead of just downloading.